We are facilitating our visitors by providing free proofreading & writing documents for the businesses and professionals. We also request you to share your written documents at SemiOffice.Com to help the non English speakers. SemiOffice.Com is a free proofreading & documents distribution company. Semioffice deliver free sample of letters, applications, speeches, essays, articles, forms, certificates, planers and resumes for our valuable visitors. SemiOffice.Com providing latest letters, applications, speeches, essays, forms, slips and invoices for your business and job. SemiOffice working hard to be a complete solution for all of your official and professional writing requirements. 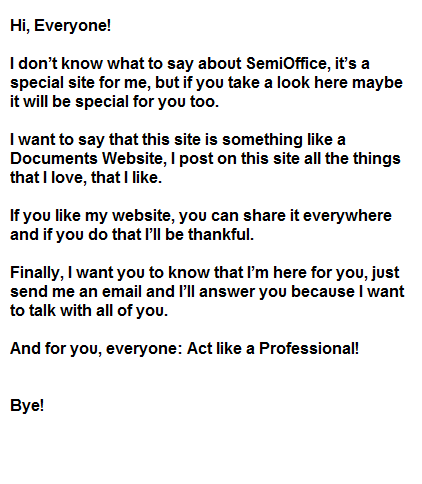 You can post and contribute by sending your created documents, letters, applications or anything else that you want to make available at semioffice.com for free. Share your ideas to improve semioffice.com. We will transform it into reality. For any further information about our services you can write us via contact form.